The Harry Potter series is filled with many funny jokes and moments. 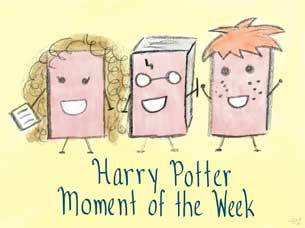 My favorite joke, although I’m not sure if it is necessarily considered a joke or if it’s more of a funny moment, is during Prisoner of Azkaban when Snape catches Harry with the Marauder’s Map and attempts to read it. Obviously, the map is warded against Snape, seeing that the creators and original owners were the Four Maruaders, and instead of the map itself being revealed, mean comments from “Prongs, Padfoot, Moony, and Wormtail” are directed at Snape instead, lol. I was quite young when I first read PoA, but I vividly remember the moment when I read this scene; I could not stop laughing. For some reason, I just found the whole situation hilarious. I don’t think I’ve ever laughed harder at any other moment in the series. Snape's reaction was perfect! Haha, I'm still chuckling about it too. That map is pretty spectacular, and this moment, is absolutely priceless. When Harry gets caught things are so tense, and then the insults start, and it's just impossible not to laugh. Great pick!! I would love to be able to create something as awesome as the Marauder's Map. It would be so awesome to just let the map insult all the people I didn't like, lol. This part made me giggle too! I don't remember anything specific but I do love the pranks the twins pull. Like that vomit flavored candy or something? That was hilarious! Yeah, anything the twins did was hilarious! I would love to just hang out with them for a day. My stomach would probably be hurting from laughing so much, lol! Yes!! I laughed so hard too. We are reading it, thinking he's about to get into so much trouble from Snape, and instead the map is insulting him. It was priceless!